Sue and Pete chose to renew their vows on their Ruby Wedding Anniversary and we´re so happy they chose us to plan it with them. With bright colours and their loving family present, it was a beautiful and memorable day we will always look back on fondly. Planning a Vow Renewal for us is quite a rarity, though such a pleasure to do. 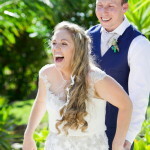 Weddings are very special as two people are committing to each other and have the promise of an adventure filled life ahead, Vow Renewals not only have that, they also have so many memories already made which are reflected in the couple, their family, and the celebration itself. Sue and Pete asked for all their children and grandchildren to wear bright colours, we had a butterfly release at the ceremony, and a balloon release (red for Ruby) down on the beach. It really was all about love, laughter, and happy ever after. Amelia and Jane were an essential part of our Vow Renewal ceremony on our 40th Wedding Anniversary. Given that we were in England and trying to arrange a close and intimate ceremony with our immediate family in Portugal it was an uphill task until we contacted Unique and Chic. From then on nothing was too much trouble and the day we celebrated in September 2016 was so organised we did not need to be concerned about anything. Everything went like clockwork, even the arrival of butterflies and letting balloons go on the beach. I could not recommend Amelia and Jane highly enough, we had the most wonderful and that says it all.